The March of the Living is an international, educational program that brings Jewish teens from all over the world to Poland on Yom Hashoah, Holocaust Memorial Day, to retrace the infamous death march from Auschwitz to Birkenau, and then to Israel to observe Yom HaZikaron, Israel Memorial Day, and Yom Ha'Atzmaut, Israel Independence Day. The goal of the March of the Living is for these young people to learn the lessons of the Holocaust and to lead the Jewish people into the future vowing: NEVER AGAIN. 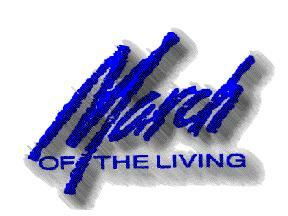 What follows is a journal from the 1994 March of the Living. This introduction page is currently under construction. Click here to start reading.